The ECB raises the interest rate – Trichet’s dilemma? With regard to price developments, euro area annual HICP inflation was 2.6% in March 2011, according to Eurostat’s flash estimate, after 2.4 % in February. 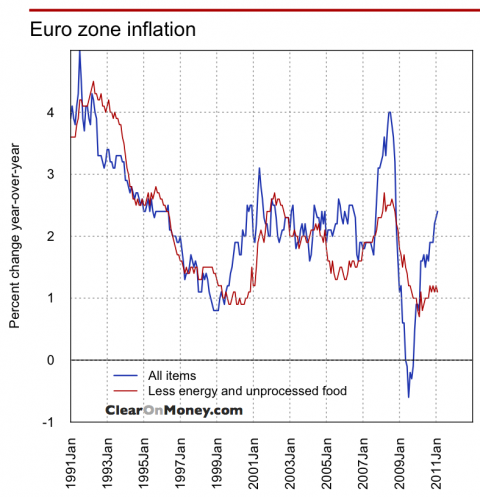 The increase in inflation rates in early 2011 largely reflects higher commodity prices. Pressure stemming from the sharp increases in energy and food prices is also discernible in the earlier stages of the production process. It is of paramount importance that the rise in HICP inflation does not lead to second-round effects in price and wage-setting behaviour and thereby give rise to broad-based inflationary pressures over the medium term. Inflation expectations must remain firmly anchored in line with the Governing Council’s aim of maintaining inflation rates below, but close to, 2% over the medium term. This comes as no surprise. In January, Trichet was quoted to reject core inflation as an indicator for future inflation, but also said the ECB would make sure that these second round effects would not arise. Here is core (red line) and total inflation (blue). The graph shows that core inflation is stable at around 1% while overall inflation is well above 2%. Core inflation has always been more stable overall inflation, since prices for energy and food are more volatile than the other prices. I believe that there is also a limit to the extent that you can fight prices in primary goods. Of course investment goes down with an interest rate hike, but the additional demand from China would probably overcompensate this kind of policy, say, in the oil market. Since China follows the Western path of industrialization, some resources will get scarcer. People in Western countries will feel this in the form of rising prices, exactly what is happening now. I am not convinced about the argument that a price-wage spiral is threatening to propel inflation rates into higher regions. Wages in the European periphery are down and at times falling, while in Germany the power of unions is still weak. From the financial point of view, a rise in the interest rates might increase the borrowing costs of those who are heavily indebted. Debt deflation would be the danger connected to the Japanese-style balance sheet problems of Ireland, Portugal and Greece. It might be argued that the fiscal problems cannot be cured by monetary policy. However, monetary policy clearly affects the fiscal problems by changing the costs of borrowing and also limiting the amount of money/credit in the system. Of course, a rise in the interest rate can only be brought about by a fall in money/credit supply. I wonder whether there is any consensus on this question between the European Commission and the ECB. On the international dimension, a rise in the interest rate will probably attract capital towards the euro zone. The value of the euro will rise, making exports dearer and imports cheaper. That might also spell problems for countries in the periphery, which are eager to export themselves out of the slump and now find that doing so – at least outside of the euro zone – becomes harder. The ECB is between a rock and a hard place. There are two threats: runaway inflation and killing off the recovery that is in process. In the coming months we’ll see whether the ECB has fought the right evil at the right time. This is a situation which seems very strange. In one part of the currency area, you have inflation and growth rates above 2%, in other areas it is deflation and stagnation. There is at least one instrument lacking needed to fight the obvious economic problems. An exchange rate would be nice, or fiscal transfers. Since both are not around the corner, the euro wobbles are set to continue as uncertainty about the recovery in the periphery will not be resolved. « German president attacks banks – BAU?